If you're looking for flooring, carpet, or area rugs in Duluth, MN, you're in the right place! Johnson Carpet One Floor & Home offers well-known, name brand flooring options. We strive to offer brands that are quality products- one of which happens to be Karastan. Whether you're looking to refresh a new look within a space or are searching for the right rug for your hard surface, our dedicated staff can help you choose based on your style, preference, and budget. Having been around since 1928, Karastan is equipped with the right technology and innovation to ensure a quality made carpet or area rug. From the All Pet Protection plan and warranty to the SmartStrand Forever Clean, options are endless when it comes to Karastan. All of our products are made with the finest, man-made materials to provide softness and beauty all-in-one. We also take an eco-friendly approach using renewable sources like wool, to promote healthier living and sustainability. Karastan carpets offer a broad range of styles that are sophisticated, contemporary, and traditional. With Karastan, quality is based on craftsmanship, art, innovation and technology which make Karastan carpets ideal for any home or office space. Karastan's reputation for area rugs dates back to the early 1900's when the first rug was made with a loom machine. Rugs are what ties a room together bringing in sophisticated designs and are meticulously crafted to beauty. Karastan Carpet is one of Johnson Carpet One Floor & Home’s premier carpet lines. Known for its reputation of style, comfort, and quality, there are many colors and styles that are quite pleasing in any interior space. Amidst our popular collection, we also offer a 10 year warranty on our Karastan carpet pad! Among our line of Karastan carpets is Shaded Escape. Shaded Escape forges a new serene path with a finished casual look in beautiful light to deep, space-dyed shades providing a fresh new look. Our most popular shades are Cigar Leaf and Iceland. Impressive Form builds on the definition of soft- with our SmartStrand Silk, Impressive Form is the most luxurious and soft carpet made. 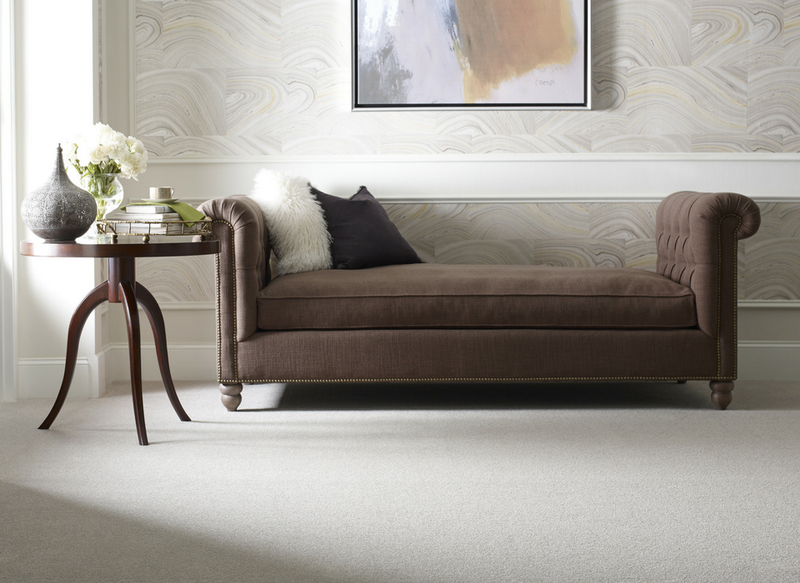 This tailored texture fleck will welcome visitors with elegance and beauty. Our most popular shades are Crips Biscotti, Soft Candelight, and Crème Brulee. Nature’s Majesty will rejuvenate any space with a new look that is made with four yarns to create a cut-pile texture. Our most popular shades are cooler tones called Urban Putty and Stonework. Learn more by getting a free estimate!